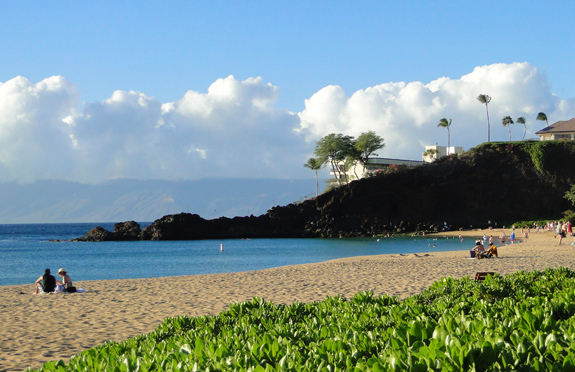 Snorkeling just off Kaanapali Beach at Black Rock, Maui is a must-do on your next trip to the island! Here are some tips to make the most of your experience and the low-down on how to get here. Prior to going there for the first time, we weren't sure if this spot for snorkeling in Maui would really be as amazing as people say it is. We also wondered if it would be suitable for inexperienced snorkelers, like we were at the time. It turns out that we worried for nothing - we had a fabulous time because the area was teeming with fish and other marine life, and ridiculously easy to access. This turned out to be one of the best snorkel areas for beginners that we've ever been to. One of the things that makes this such an amazing place for snorkeling is that you don't have to stray very far from shore to see the fish - this makes it great for anyone who's doesn't want to venture out into deep water! Also, the first time we came here, we were staying at the Royal Lahaina Resort right there on Kaanapali Beach... Black Rock was just a very short walk away - less than 5 minutes - Maui snorkeling doesn't get any more convenient than that! 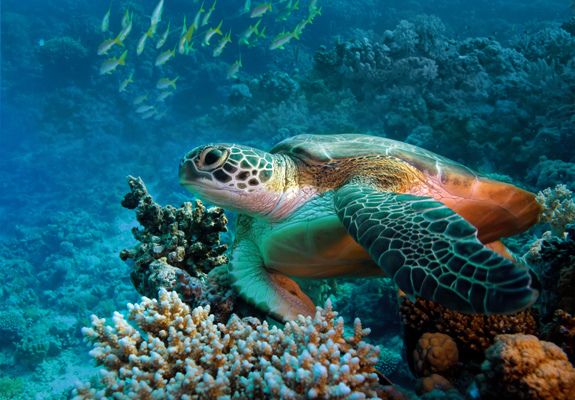 If you're an experienced snorkeler, that doesn't mean you should skip this spot though. 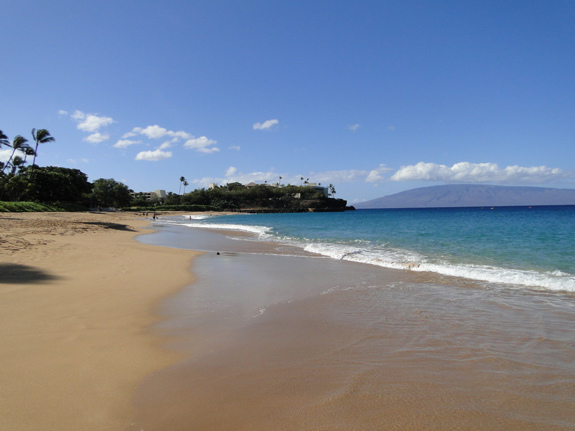 Kaanapali Beach is well worth a special trip to see and since you'll be here anyways, you might as well go for a quick snorkel and check out the fish - there aren't many times in life where you'll see so many fish with so little effort. If you stay until sunset, you'll be rewarded with a free viewing of the nearby Sheraton's torch lighting and cliff dive ceremony. 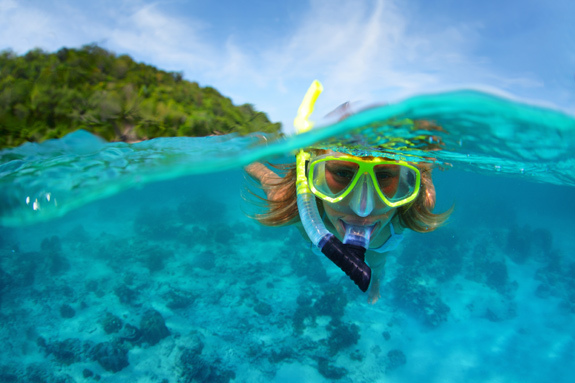 Add to all that the fact that it costs you absolutely nothing to snorkel here, and what's not to love! The Daredevils Are Out to Play! Or, like me, would you rather just watch them? 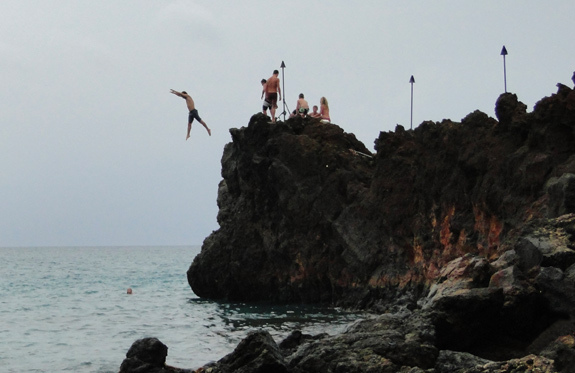 It's a common sight at Black Rock to see people leaping off the top of it into the ocean. I'm not recommending that YOU do this, and if you do, it's at your own risk. 1) Don't snorkel too close to the point. Black Rock juts out into the ocean and a lot of people are tempted to swim around the point to snorkel there. Please don't. That area is prone to rip currents and people have been known to get caught up in them and never be seen again. As long as you are careful to snorkel close to the beach like we did, it will be much easier for you to stay safe! 2) Snorkel with a partner so you can keep a close eye on one another, in case one of you gets into any kind of trouble. It's not that snorkeling in Maui here is necessarily any more risky than other places... but hey, using the buddy system is a good habit to keep whenever you're in the water! 3) It can get very crowded on the beach directly in front of Black Rock, Maui. If you plan on hanging out here to sunbathe and swim, too, park your beach blanket a little bit further down Kaanapali Beach so you'll have more space! If you're wondering how to get to Black Rock, you'll soon see how easy it is. 1. 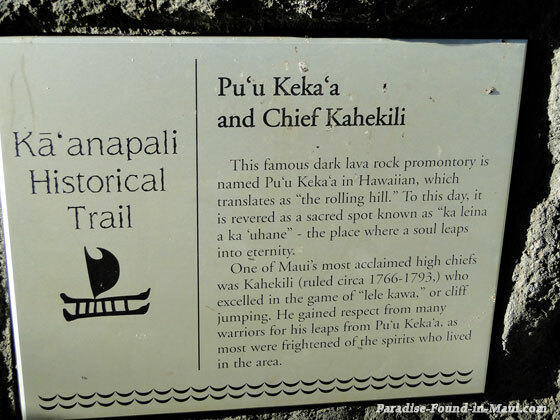 On the west coast of the island, head down the Honoapiilani Highway towards the Kaanapali Resort area. 2. Turn towards the ocean (left, if you've been driving north; right if you're driving south) onto the Kaanapali Parkway and drive for a bit - I'd estimate 5 minutes or less. 3. Next, you can park at one of two places, both located on the ocean-side of the road. Option one is to park at the Whaler's Village Shopping Center parkade - you'll have to pay to park here, unless you spend enough money at qualifying shops or restaurants to get it for free. Option two is to drive a little bit further along and look for the public access walkway to the beach and the (limited) free parking next to it. While Black Rock is a great place to snorkel right off the beach, there are plenty of other fantastic spots that are only accessible by boat. And this is where tours come in. The guided snorkel trips I've been on have been highlights of my time on the island, and I highly recommend that you go on at least one of them if you enjoy snorkeling as much as I do. Whenever possible, I buy my own tickets from Barefoot Tours. I do make a small commission if you use one of my links to book through them - it's not a lot, but it helps to pay for the expenses of running this site, and doesn't cost you anything extra. So if you use one of my links to book through them, thank-you SOOO much - I can't tell you how much I appreciate your support! 1) Our favourite stretch of beach is just a short stroll away. It's the perfect spot to hang out after you've finished snorkeling at Black Rock... Find out why we love this particular stretch of Kaanapali Beach as much as we do!